[i] Snelling, A. Earth’s Catastrophic past Vol. 2 pg. 747. [iii] C Turner et al. Sedimentary Geology 167 (2004) 309–355. 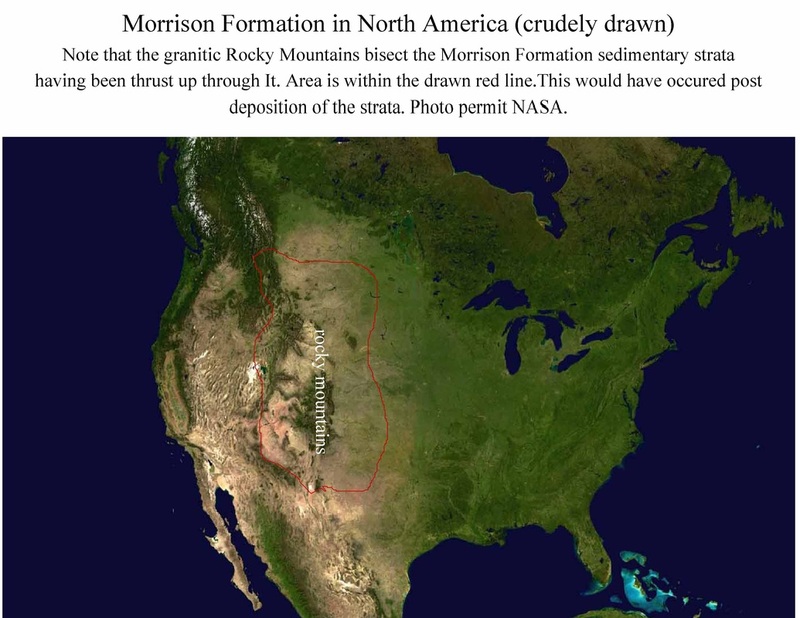 While this article does not support Flood geology it has a nice map of the Morrison Formation and its expanse. [v] G.Fleshi New Mexico Geol. Soc. Guidebook, 25th Field Conf., Ghost Ranch (Central-Northern N.M.), 1974 The author of this secular article does not support the concept of a worldwide flood, at least in this article, but the intercalation of strata is well documented. ICR's Dr Clarey, a PhD geologist, has studied the strata across the continental United States. He feels that there may have been a peninsula of high ground in the west onto which dinosaurs were able to flee from the Flood till the later end of it. He notes that flood deposits in the west are much shallower that in the east US. After the breaking up of Pangea, the one land mass composing all continents, large tsunami-waves may have moved steadily up for south to north. He is comments that this is supported by the observation that there are many dinosaur graveyards with adult species only and more so in the northern part of the continental US. See link below-although this current article from 2-2015 is not online yet as of 1-29-15. But others are including articles from 1-2015. Pleas note: Dr Clarey has taken the same data as the evolutionary geologists and placed it into another scenario just as valid as the long age ones. This reveals the limitations of using science in attempting to answer questions regarding past unique events. "At Dinosaur National Monument in Utah, a confused tangle of bones juts from a ridge	of sandstone, chock-full of dinosaur fossils. The sandstone is part of the Morrison	Formation, a body of sedimentary rock extending from New Mexico to Saskatchewan	in the north and covering more than 1 million square kilometres (400,000 square	miles) of the western US and Canada. Eleven different species of dinosaur have been	dug from the quarry at Dinosaur National Monument, including one of the largest	and most complete skeletons of a giant Apatosaurus ever found.The dinosaur bones are concentrated in an extensive lens-shaped bed of rock and	are an outstanding example of a ‘mass burial’ deposit." 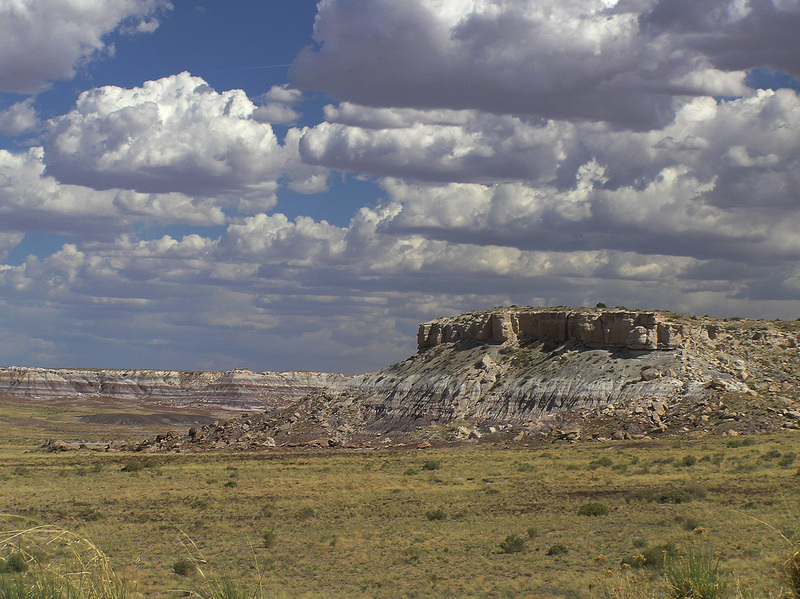 The Painted Desert/Petrified Forest is an excellent example of catastrophic destruction and fossilization. In contrast to trees dying-with defoliation,debarking, and root degradation and then falling into streams with subsequent burial in a muddy estuary the evidence is more consistent with massive flooding and destruction and rapid burial. The present fossilized trees are largely denuded of bark, have no limbs or roots. The display at the Park notes this. However, as noted in figure 1 many trees are oriented in the same direction with their root bulbs. Given that these trees are large 50-100 feet in length or more, argues for a fast flowing massive flood condition. That the root bulbs are blunted at the end, and that matted root material is found in the same strata (or nearby) argues for the trees being torn from their bases, and not having rotted beforehand (figure 2,3). Most trees are denuded of their bark, but some have it being partly peeled off as the trunk was being buried (figure 4, 5 with insert from Mt St Helens volcanic denuded tree for example). 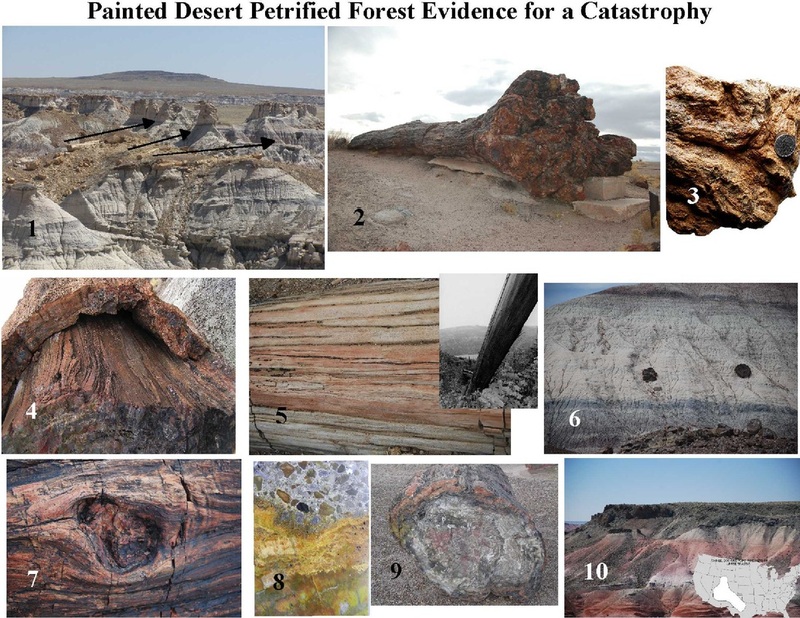 The trees lie in parallel in ashy/betonite layers from volcanic destruction (figure 6), not the runoff mud of a freshwater spring as the Petrified National Forest mural implies. The inserts of branches into the trunks reveal that they were torn off as the tree was being buried as few show any process of the trunk attempting to heal the site, and some are jaggedly torn off (figure 7). Most trees are buried in a sandy or betonite clay which is silicon rich, and probably had an acidic pH during the fossilization period. Volcanic ash would have provided an acidic environment. The casing around these tree trunks formed a hard cement. (figure 8). The trees are often flattened before fossilization indicating rapid burial under a heavy overburden, as many have intact growth ring patterns (figure 9). These characteristics are not typical of a stream runoff soil or burial. There is much evidence of volcanic activity as seen throughout the region with magma layering directly on the sandstone/betonite layers (figure 10), and numerous volcanic cores throughout a vast area of the Southwest US (see insert).None of this points to the lush vegetation, and meandering streams presented by the Museum there. All of the observations are more consistent with a massive flood event with very active volcanic eruptions occurring near the end of the flooding. While this could be consistent with a regional event, it can also be evidence for catastrophic deposition as seen in similar strata on other continents-and thus it can be consistent with a worldwide flood event. Examples of Life Forms Animal and Plant Crushed at the Time of Burial and Subsequent Fossilization. 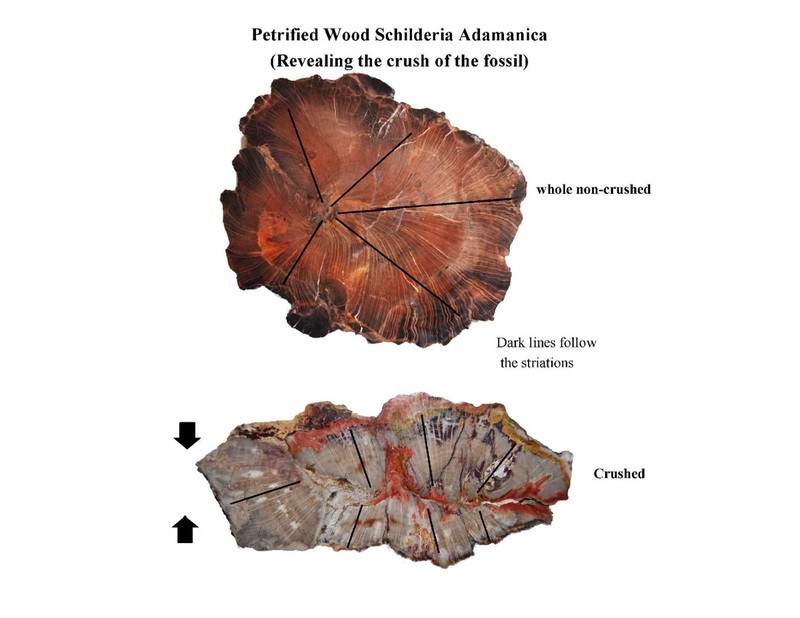 Petrified Wood Schilderia adamanica (an example of crushed and un-crushed trees) Note: the whole Schilderia slab is found at the Petrified Forest Museum AZ with a comment that it is a tropical conifer. So, it is thought to have been found in the tropical regions prior to its destruction, and with continental plate movement is now located in a desert in the Northern Hemisphere. This can be consistent with massive plate techtonic shifting during and post flooding. In the picture the lower section is crushed with intact striae, supportive of it having been buried rapidly under a large overburden-prior to any degradative processes. Yet it, the crushing, probably occurred post-fossilization as the striated segments are fragmented and not bent or curved. Both samples are from the Painted Desert area of eastern AZ. These observations can be put within and are consistent with a catastrophic burial and not settling in the swamp ooze. It is also consistent with being part of massive flood event as the Chinle Formation covers large areas of the Southwest and similar Eastern areas of the US. This is consistent with what might be observed post a massive catastrophic flood-The Noah Flood is such a flood. "Regarding the allochthonous origin of the prostrate logs, there is little dispute. However, very often the logs are interpeted as being born in rivers and streams to their present position. But other explanations are also possible. A model has been developed which could account for the allochthonous origin for the petrified logs without doing violence to the evidence of uniform sedimentary emplacment. This model involves the sedimentation of tremendous quantities of volcanic ash (of which the Petirified Forest member is largely composed) in a body of water resulting from the Genesis flood. Trees rafted in from a forest devastated by the flood became stranded in the volcanic mud as the waters ebbed and flowed in the basin. Subsequent deposition completed the process of emplacment...." See page 23 of the below article. Click on button below for article. Dr Tas Walker defined Polystrate Fossil Trees as "Tree trunk fossils are frequently found cutting across many geological layers—hence the name polystrate fossils (poly-= many; stratum = layer)." "It is not possible that polystrate fossils were buried gradually over many thousands or hundreds of thousands of years because the top part of any tree would have rotted away before it could be protected by sediment. Polystrate fossils point to rapid burial and are evidence for the reality of the global Flood recorded in the Bible." Even George Fairholme recognized this in 1833 in his book General View of the Geology of Scripture (1833). Below is a polystrate fossil tree drawing from Fairholme's book. Also, there is a recent photograph of an upright fossil tree protruding through multiple sandstone strata from NM. Link to article by Dr Walker on polystrate fossils below figure. by Steven A. Austin, Ph.D.
Up to 400 feet thickness of strata have formed since 1980 at Mount St. Helens. These deposits accumulated from primary air blast, landslide, waves on the lake, pyroclastic flows, mudflows, air fall, and stream water...."
The landslide generated waves on Spirit Lake stripped the forests from the slopes adjacent to the lake and created an enormous log mat, made up of millions of prone floating trunks that occupy about two square miles of the lake surface....Careful observation of the floating log mat indicates that many trees float in upright position, with a root ball submerging the root end of the trunk, while the opposite end floats out of the water. Hundreds of upright floated and deposited logs have been grounded in shallow water along the shore of the lake. These trees, if buried in sediment, would appear to have been a forest which grew in place over hundreds of years, which is the standard geological interpretation for the upright petrified "forests" at Yellowstone National Park...." See Article by ICR below. Comment by JGL: It should be noted that the debate over whether Polystrate Fossils represent trees in situ in a boggy swamp over come by local flooding or massive uprooting and re-positing during massive flooding (whether local or regional or worldwide) is a good example of the problem of assessing geologic data post event that was not observed. Both Creationists and Evolutionists use the same data but put it within a certain religio-philosophic framework. I believe that the data from Mt St. Helens gives a plausible way that many fossil polystrate trees were preserved. But that remains an assumption as does any other explanation. USGS Photos that Reveal the Massive but Local Distruction done by the Mt Saint Helens Eruption in 1980. Consider the massive destruction in this one localized area. Then imagine the degree of similar destruction that may have occurred simultaneously on a regional and even continental wide area-such as seen in the Noah Flood Account.From the appearance of various strata the action would have involved a massive ebbing and flowing process. This book is a little older, written in 1984, but contains many abstracts relating to geological articles in the secular press that have data consistent with catastrophic formation of the earth. See link below. "Dropstones are rocks that have been carried and dropped into finely grained sediment. For instance, icebergs can carry and drop rocks on the ocean floor, to be covered by further sedimentation. Noah’s flood was a worldwide catastrophe that deposited much of earth’s fossil-bearing rocks. However, within these rocks, we find what appear to be dropstones...dropstones can be formed by mechanisms that don’t involve icebergs. For example, floating tree stumps can have rocks entangled within them, which are then dropped on the ocean floor. Moreover, recent research in the journal “Marine Geology” has shown that a large seaweed known as kelp has a surprising ability to carry and drop sizeable rocks...." See CMI video for more information at link below.